The Gmail Android app is receiving an update this week that introduces two new features that after using, will probably make you wish were around years ago. 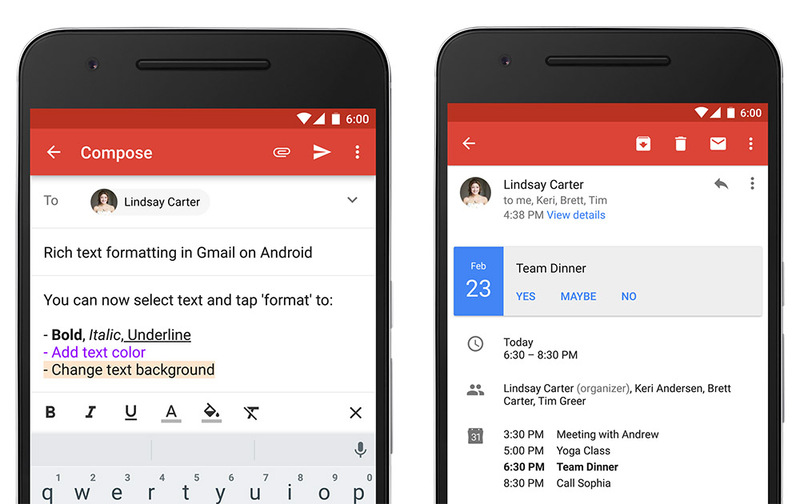 Those new features are rich text formatting and instant RSVPs to calendar invites. With rich text formatting, you’ll be able to bold, italicize, underline, color, and highlight text in an email without having to leave the Gmail app. In the image above, you can see the new rich text formatting bar that lives just above the keyboard, at the bottom of an email draft. As for instant RSVPs, if you use Google Calendar or Microsoft Exchange, you’ll start to see boxes appear in emails with options of “Yes,” “Maybe,” and “No” when you receive a calendar invite. The boxes will also include snapshots of your schedule, so you can respond without opening up another app.